Brooke Aden’s hog bottomed out and broke a 400-pound capacity scale. 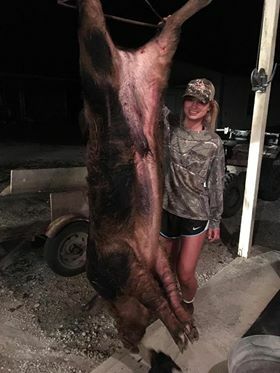 Another view of Brooke Aden’s 400+ pound lowcountry hog. Brooke Aden of Mt. Pleasant, SC loves to deer hunt, but on one part of her family’s hunting land in Berkeley County, the wild hogs have taken over. She doesn’t mind that, because she also likes shooting hogs. So on the evening of Sept. 23, she carted her .243 into the woods, hoping for a grilling-sized pig to shoot. What she got was much bigger. “I got in the stand around 5:15 that evening, and I waited around for about an hour and then I heard a ruckus. It sounded like squirrels fighting, but the noise kept on coming, and then five pigs walked out. I noticed the one in the back was bigger than the others, so I mounted my rifle and shot it. The pig dropped right there,” she said. 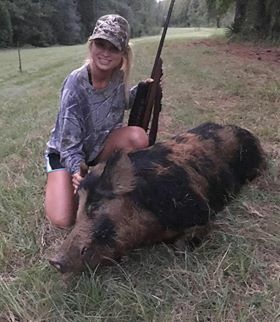 Aden was in a ladder stand mounted to a pine tree and overlooking one of the swampy areas of the property, and she shot the hog at about 40 yards. When it fell on the spot, she decided to ride her ATV to it and see if she could load the hog without calling for help. She quickly realized the hog was much bigger than she’d estimated. 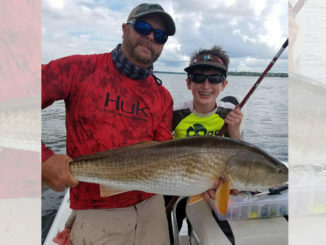 “I thought it was going to be about 100 pounds, but when I got to it, I could see it was my biggest hog by far. It looked 6 or 7 feet long. I knew there was no way I could lift it myself, so I called my brother and dad and they came and loaded it up,” she said. 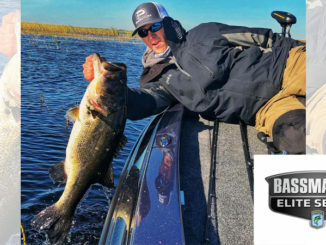 They were able to locate a 400-pound capacity scale, but the hog bottomed it out and broke it. “When we cleaned it, the fat layer was over two inches thick. We gave it to some friends of the family because it was just too big for us,” she said. Aden has been hunting since she was a kid and has turned into an all-around lover of the outdoors. After telling her hog hunting story, she was off to get ready for a frog-gigging trip in the Santee area.